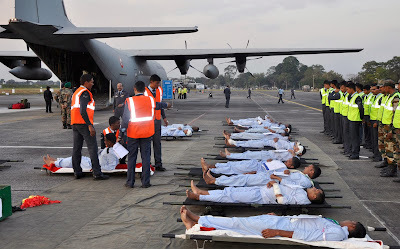 An Indian Air Force (IAF) C-130J Super Hercules aircraft was on Friday, modified into an air ambulance configuration with 'patient transfer unit' and life saving equipment with services of 'critical care air transport team' for speedily airlifting 50 mock patients on stretchers from a simulated disaster zone in Jorhat, in upper Assam to Bagdogra in North Bengal. IAF helicopters including Chetak (Aloutte-III), Mi-17 and AN-32 transport aircraft configured in air evacuation role also participated in the drill. 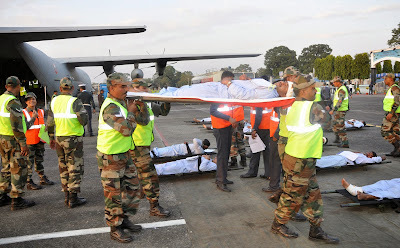 The IAF aircraft displayed their speedy and efficient casualty evacuation capability from a disaster zone. The exercise 'CASEVAC EAST 2013' was part of a massive casualty evacuation (CASEVAC) drill mounted by the IAF in Eastern Air Command for demonstration and benefit of various stakeholders including army, para-military forces and disaster management response managers of Darjeeling, Jalpaiguri and Sikkim. The exercise successfully showcased the IAF and Army's operational preparedness, cohesion and professional capabilities besides synergising inter-dependencies among the various stakeholders in disaster situations. It was also aimed to evaluate, analyse and adapt to ever-changing situations, lack of time, information and resources.